" Revive the lost sheen of your hair and bedazzle everyone with your awesome hair! 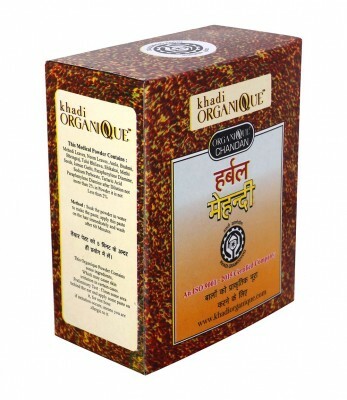 Delicately condition and color your hair naturally to unveil its intrinsic beauty with Khadi Organique’s Brown Herbal Mehndi.An amalgamation of 10 natural ayurvedic herbs, it captivates nature’s goodnessrevealing the inborn beauty of your hair. Enriched with vital nutrients, it naturally nourishes hair leaving it bouncy and full of lustre. Promoting hair growth, reducing hair fall, it keeps the scalp cool and removes dandruff. Strengthening the hair, this magical formula based on secret wisdom of Ayurveda, gives the hair a natural lustre and beauty leaving everyone spellbound "
" Mehndi Leaves, Neem Leaves, Amla, Brahmi, Bhringraj, Tulsi, Bhilawa, Shikakai, Methi Seeds, Jamun Guthi, Paraphenylene Diamine, Sodium Perborate "